Safiya fostered and adopted Alani (center), who will be 4 years old in June. (left to right) Liam, grandma Daisy, Alani, mother Safiya and Lukas. Safiya is a bright, ambitious young woman. A social worker by trade, she knows the struggles of vulnerable children. At two public high schools in Brooklyn, Safiya works with students who have special needs. Safiya’s experience in social work and her desire to pursue a doctorate in that field did not prepare her for how her three children would come into her life. Safiya very much wanted to become a mother. Focused on school and her career, Safiya thought that her time to have biological children was running out. When she faced difficulties, Safiya turned to IVF. “As a mother, it was a struggle to see her heart get broken every time it didn’t work out,” said Daisy, who now helps care for her three grandchildren. In the past, Daisy also fostered children when she lived in Charlotte, North Carolina. 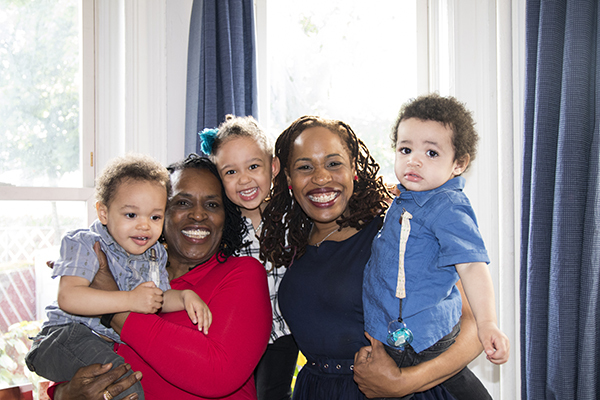 Through the social work profession, Safiya learned of HeartShare St. Vincent’s Services and received a recommendation from a woman who fostered and adopted two sons from the agency. “I decided that I wanted a child and I welcomed however that child would come to me,” said Safiya. Safiya expressed her interest in fostering a girl ages 0-2 with the intention to adopt. She attended trainings and adjusted her life to fit all the criteria to become a certified foster parent, including moving from her studio apartment to a place that would have a bedroom for the new baby. Then, she waited. Several months later, on a Friday night at 8 p.m., Safiya received a call. “We have a baby. Do you want her?” she remembers hearing over the phone. Safiya was elated. She also was panicked that the baby being placed with her might be taken away at some point. Safiya still said yes. By midnight, Safiya had slumbering 11 month old Alani in her arms. “I remember the first time she opened her eyes that night. She looked up and smiled. I melted,” recalled Safiya. She describes Alani as a very happy baby, who was always cooing and laughing. As time went on, Safiya was afraid that Alani would be taken from her. Alani ultimately was freed for adoption and permanently became Safiya’s baby girl. And four months after Alani first came to her, Safiya became pregnant with twins. “I don’t know what aligned in the universe after Alani came into my home, but now, I have the daughter I always wanted and my beautiful boys. I can’t believe it,” said Safiya with a huge smile. With her mother’s love and care, Alani has grown exponentially. 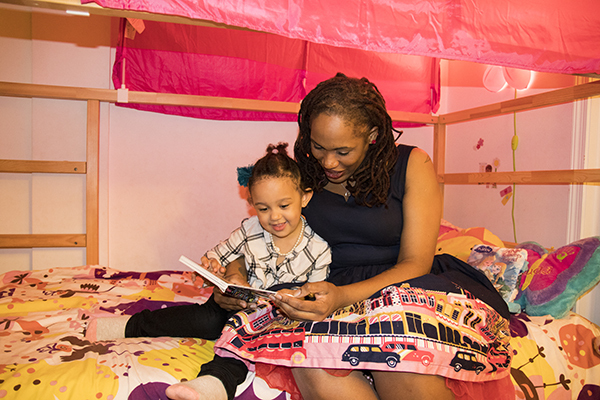 At the end of the day, Alani curls up with her mom for a bedtime story. Today, Alani is nearly 4 years old and ready for pre-school. She’s grown exponentially in Safiya’s care. Alani is talkative and inquisitive, taking a liking to puzzles and reading. She also loves taking care of her two year old baby brothers, Liam and Lukas. Alani won’t go anywhere without her pearl necklace and a flower in her hair. Safiya has high hopes for Alani. “Alani is so bright. She gets bored with a 24 piece puzzle and looks for one with 60 or more pieces. I know she’s going to do well in pre-school,” she said gleaming with maternal pride. “She’s headed straight to the honors class,” she joked. Safiya, like many foster and adoptive parents, will do whatever is necessary to make sure their child has a healthy and strong future. And that means acknowledging the past. Safiya has kept ties with Alani’s biological family.